Five hundred years ago the Intaki people lived a simple life on their home planet. For them the sky was a mystery they were only slowly unfolding with their pre-industrial technology. Then the Gallenteans arrived and swept them into the modern age in one swift stroke. The Intakis, initially overwhelmed, adapted quickly and within a century they had seasoned space travelers and active members of the Gallente governing body. They soon established their reputation as fair-minded humanists that excelled as deft negotiators and clever businessmen, fitting perfectly into the Gallentean way of life. The social uproar following the Caldari departure from the Federation touched the Intakis deeply and many of them sympathized and even supported the Caldari - the yoke of the cumbersome Federation bureaucracy lay as heavily on the Intakis as the Caldari. Understandably the Gallenteans were forced to deal harshly with these elements to prevent a complete fragmentation of the young Federation. Apart from a few minor uprisings the Federation quickly subdued the Intakis. Those deemed the biggest threat to the stability of the regime were arrested and exiled. Some of these went over to the Caldari side, but the majority of the exiles, some five thousand in total, went out into the great unknown at the outskirts of Federation space. There they built themselves new homes in the form of sprawling space stations - the Federation barring them from colonizing any planets or moons. In time as the exiles became more organized and their power increased through asteroid mining and black market trading they formed a loosely connected organization and termed it the Intaki syndicate. The syndicate is not political in any sense - each member station enjoys complete autonomy - but they share economical information and help each other in security matters. The territories of the Intaki syndicate are open to everyone, no matter their race, political creed or legal stature. The syndicate is not vastly wealthy or powerful, but they serve an important function on the fringe of empire space - acting as the safe havens for anyone and everyone where everything can be bought and sold, no questions asked. While the Federation was still the Promised Land the syndicate territories received the residual immigrants that weren’t allowed into the Federation for one reason or another, thus slowly growing in size and importance. Each syndicate station has its own governor who has complete authority over their station and its surroundings. These governors are those that were instrumental in constructing the station all those years ago, or their descendants. The unofficial leader of the syndicate in years past was the governor of Poitot station, Dorn en Diabel. A charismatic and passionate leader he installed order in the chaos that reigned after the exile and set the foundation of the syndicate. Like so many prominent Intakis en Diabel was an albino, which lent his authority the strength needed to push his will through. A decade ago en Diabel died in a freak accident, meaning his mind couldn’t be transferred to his clone. His eldest son inherited his father’s position as station manager of Poitot station. But trouble was brewing on the horizon. Syndicate rivals of the en Diabel family were gathering strength for a coup. Not possessing his father’s shrewd political mind young Gare en Diabel was clearly out of his league and his equally weak siblings on Poitot were incapable of lending the kind of assistance needed. But one child of Dorn en Diabel was not on Poitot, nor had been for more than five years. Silphy en Diabel, his youngest, had been sent off to the Sisters of EVE after one heated row too many with her father. Alone among Dorn en Diabel’s offspring Silphy had inherited her father’s wits and passion, as well as her mother’s fiery temper. Her stay with the Sisters, initially intended as a punishment, grew into enthusiasm for Silphy - for the first time she was free of her father’s iron will and free to live as she liked. She struck a friendship with Santimona Sarpati - an influential Sister that also happened to be sister to the notorious V. Salvador Sarpati, head of the Serpentis Corporation. But just as Silphy’s career with the Sisters seemed poised for rapid take off, she decided to heed the desperate calls of her family and head back home to Poitot. Once there Silphy quickly assessed the situation and then in one swift stroke as cunning and brutal as any her father had deceived, she seized the initiative. First, she altered the station charter so that from now on the populace would elect the governor for life, this went unopposed as the family’s enemies thought this a sign of weakness - their view confirmed a week later when one of their own was elected governor. But then Silphy put the next step of her plan into motion: she secretly arranged for attacks on all inbound food supply ships, thus slowly putting Poitot station in a state of starvation. Naturally, the enraged populace blamed the new governor. Silphy, using her Sisters of EVE influence, then had emergency food supplies brought in on vessels of the en Diabel family (which were of course left alone). Thus Silphy made herself champion of the people and when the governor was driven out of office Silphy won the next elections by a landslide. 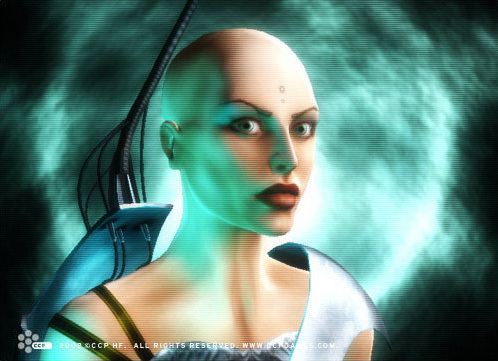 Having shattered the reputation of her enemies she started systematically ruining them financially until she was the undisputed leader of Poitot station. At the same time Silphy strengthened her position as the head of the en Diabel family - she sent her brothers abroad and kept a strict control of their monetary allowance to keep them dependant on her. She has also slowly asserted herself as supreme leader on Poitot station, the brief influence of the populace soon to fade to nothing. In the years since Silphy en Diabel became governess she has regained her fathers prominence as the unofficial leader of the leaderless Intaki syndicate. Her power has never been seriously tested, although she lost her connections with the Sisters of EVE once it was discovered that she’d collaborated with the Serpentis Corporation in her bid for black market dominance in and around the Federation. Santimona Sarpati, once her good and trusted friend and ally, has turned her back on her and just as she calls her brother King Sarpati she now mockingly calls Silphy Queen Silphy of the syndicate, stating that they compliment each other perfectly in their exploitation and contempt of their fellow humans.